2016 Birdathon Big Day champs. The team to beat in 2017. 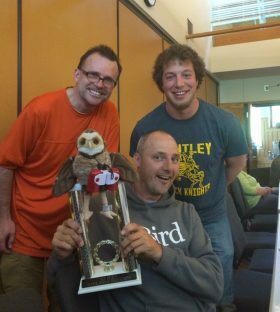 Birders of all levels of ability are invited to participate in this fun citizen-science event individually or with a team. You can compete in the Big Day by counting as many species as you can find within the 24-hour time period. Or, you can compete in other categories, such as a Big Sit or the non-motorized division. Prizes will be awarded for each category. Even if you can’t participate, we hope you join us as a supporter of the event. This Birdathon helps bring in needed dollars for the Hawk Ridge bird conservation research and education programs. You can make a general donation by clicking on the “DONATE” button below or by pledging directly to a participating team. To make a general birdathon donation, click on the Donate button below. To make a pledge to a team, select the team from the pull down box (listed alphabetically) and select Pay Now.